Let's celebrate STEM Friday with another great picture book nominated for a Cybils award: A Frog's Life by Irene Kelly and illustrated by Margherita Borin. When you pick up the book, the first things that catch your eye are the brightly colored frogs on the cover. Margherita Borin's watercolor, pen and pencil illustrations leap off the page. They are both marvelously accurate and cleverly put together in ways that will make young readers smile. For example, the critters that frogs eat (flies, beetles, etc.) are grouped into a frog shape, as through they are inside an invisible frog. Fun! The text takes readers on a journey into the world of frogs. They will learn what frogs are, where frogs live (their habitats), compare the biggest to the smallest, and find out about their life cycles. The best part of the book is all the different kinds of frogs identified in the illustrations. Look for the Vietnamese mossy frog, the giant monkey frog, and the Madagascar tomato frog. Yes, those are real names! A Frog's Life will delight young readers interested in nature, animals, and particularly in frogs. Hop on over to your local library or book store, and pick up a copy today! Learn about frog anatomy and life cycles with science activities at our previous post. Check the Frog Watch Citizen Science project website for lists of frogs and toads by state, most of which include recordings of their songs. You can also find out how to become a Frog Watch volunteer. A puzzle: A number of years ago we visited the California Academy of Sciences. 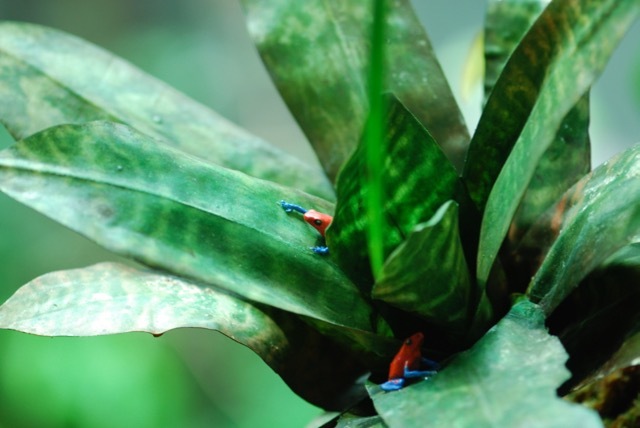 In a large exhibit that featured live birds, butterflies, and leafcutter ants, we spotted the strawberry frogs in the plant below. Do you notice anything about them? Let us know in the comments. Want more information? 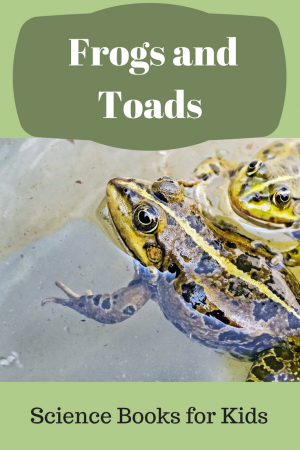 Visit our growing list of children's books about frogs and toads at Science Books for Kids.